Lentils are considered a super food that does more for the body than most other food types combined. As a legume, lentils are one of the easiest beans to prepare and can go a long way in keeping your body fully stocked with energy producing fiber. Cooking lentil soup allows the intake of natural nutrients along with a great way to satisfy hunger throughout the day. Lentils lower cholesterol and improve heart health (1). The higher volumes of soluble fiber lower cholesterol and reduce risks of heart disease and stroke by scrubbing arteries. The soluble fiber develops a gel-like substance in the digestive tract and collects bile that contains cholesterol and pushes it out of the body (2). We know that protein is important for encouraging muscle strength. Lentils not only provide protein (18g per cup) but also stabilize blood sugar levels helping keep insulin from bouncing around (3). The slow release of nutrients and fuel acts as a buffer against quick shots of blood sugar that helps maintain weight. -4 cups vegetable or beef broth. -Black pepper and oregano to taste. -Soak lentils in water for 2 hours to soften and then drain. 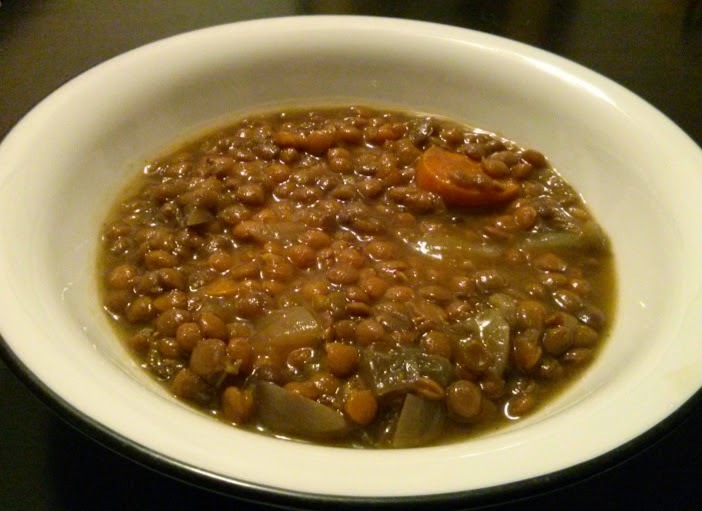 -Stir lentils and all other ingredients in slow cooker. Cook on medium heat for 8 to 10 hours.